Eating, dining, drinking – here are the best places to do all of them this year. Proudly old-school and staying that way, burger institution Andrews Hamburgers have finally expanded after decades of trading in Albert Park. And there’s no brioche in sight. Our tastebuds have come back with a verdict – Very Good Falafel is actually, very good. There’s nothing particularly new or ingenious about these falafels, they’re just made with incredibly high quality, fresh, (and more often than not) homemade ingredients. Stacking is in at Royal Stacks! From triple pasture fed beef patties to mac & cheese croquettes, we guarantee these burgers will stack up to all your cheese-filled dreams. From tiramisu french toast to slow cooked lamb eggs benedict topped with apple cider hollandaise and Swiss brown mushrooms – never do boring brunch again at Next Of Kin. At Oh Deer Korean Fusion, they coat tender pork ribs in stringy, hot melted cheese. Oh dear – there goes that diet. If you try no other fine dining restaurant this year, head into IDES for a dining event to remember. Yellowtail tuna marinated in spicy mayo topped with a rainbow of vegetables on a bed of rice? Who can be fork-ed packing lunch when there’s Poki Time. For your anti-brunch friend, head into Chotto. Serving Japanese-style breakfast including delicate breakfast sets and a drool-worthy mandarin mille feuille, it’s the best of all worlds. This steak-filled empire has all your meat-y, greasy, cheese-y needs under one loaded roof. Our pick from Empire Steak’s sambo line up is The Tradie with steak, cooked egg, cheese, shaved beetroot and homemade tomato sauce. From orange and fennel French toast to a soba noodle salad with poached coconut chicken, purple carrot, coriander, black sesame and pumpkin seeds with miso dressing – there’s really, quite diplomatically, something for everyone at The Diplomat. Because any place with a peanut butter hot chocolate and a free-range ham & gruyere baked croissant is a-ok in our books. This teensy 20-seater café is hopping with business. It’s no surprise, when you’ve got dishes like a peanut butter parfait with crumpet crumble, banana and bacon. A laidback all-day eatery dishing out everything from waffles with fried chicken in the AM and deep fried apple pies when the stars come out, head to Bedford Street straight after or just before bed. The only pending decision when it comes to Penta is whether to order the Nutella Panna Cotta with nut butter, banana sushi and a honey joy crumb, or the Orange Blossom Hotcakes topped with meringue (among other things). Jinda Thai’s highly anticipated little sister specialises in Thai-style brunch! Don’t expect any diluted form of Thai cuisine – everything here is unashamedly authentic, right down to the subtly sweet housemade buns served with pumpkin and pandan kaya (a type of coconut jam). When you have Tiramisu pancakes on the menu, complete with a side of hot maple syrup ristretto and espresso ice-cream, you have our attention. This dish is also gluten-free, so there’s no need to send distress signals. We would have guessed that there’s not much wiggle room in Melbourne’s brunch scene, but Sartoria proved us wrong! Expect creative dishes like buffalo yoghurt hotcakes with green tea cream or waffle hash browns with charred petals. Everyone’s favourite kitten – Abbotsford’s picture-perfect Kitty Burns makes some of the best brunch in Melbourne. The French toast with compressed petite red apple, maple syrup whip and white chocolate ganache will get your tastebuds purring. Small Axe Kitchen serve breakfast pasta – and not the kind you eat cold, standing in front of the fridge, because you’re hangover and there’s nothing else in the house. Bentleigh might not be humming with business, but Astroluxe certainly is. The indulgent should try the eggs benedict with 12 hour slow cooked ham hock fingers, poached eggs, cider hollandaise, compressed apple, snow pea tendrils and a slice of butter slathered toast. The hero of dieting, DIY Poke bowl at Melbourne’s newest Hawaiian-inspired venue, Poked. Combining a few of our favourite things into one, enormous bahn mi, Hawker Boys’ Soft Shell Crab Bun is the stuff of bahn mi heaven. As the name implies, Higher Ground is next level. Everything from the service to the interior and the food to the drinks, this is a must visit for this year. Boasting a beginner-friendly wine list with every item on the menu paired with a suggested wine, 505 Wine Room is an ideal date spot if you’re among the wine clueless. Don’t go past the sweet potato arancini with kaffir lime and coconut & chilli jam. Luxe is the deal at The Crux & Co. The Crux Breakfast Board with housemade crogle (that’s croissant-bagel), éclair, macaron, cream of coconut, chia seeds, toasted coconut, fresh fruit and orange juice is breakfast and dessert on one plate. The youngest in the Calombaris empire, we could eat Hellenic Hotel’s prawn toast with taramosalata and sriracha all day. As the wall demands in glowing letters, “let them eat croissants”. And eat them we shall. From airy chocolate croissants to creamy, crunchy almond – good luck narrowing your choice to just one at Gontran Cherrier Boulangerie. A strong front-runner for the best American slow ‘n slow barbeque joint in Melbourne, The Gem is our little gem. Meat-y without being oily, Meatworks’ is a perfect place for the beginner carnivore. Their hearty beef stew with slow braised diced beef chunk streak in a garlic red wine broth and root vegetables in tenderly soul warming. 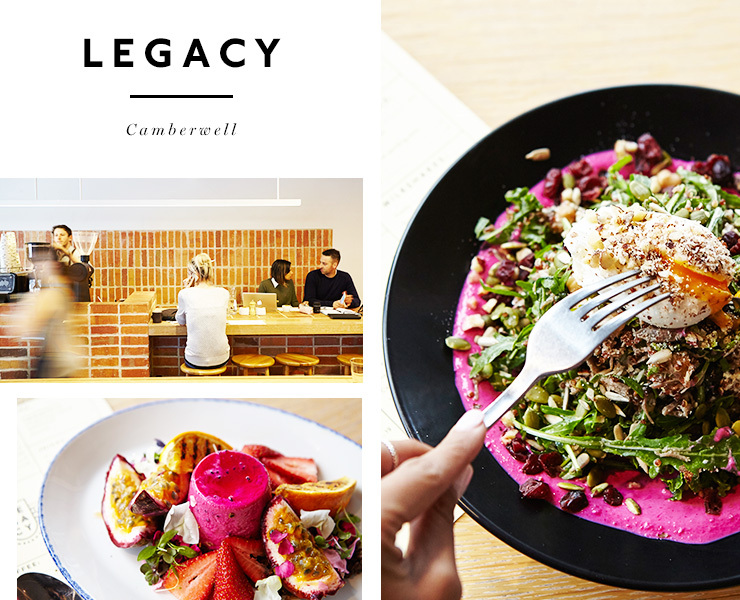 Go to Melbourne’s dedicated Happy Place. Pioneered by Lola Berry, happy smoothies include the salted caramel with almond butter, banana, cinnamon, maple syrup, carob, almond milk and salt flakes. Apple strudel French toast with white balsamic apple topped rum and raisin ice-cream? Yes Mammoth, what a mammoth-ly good idea. Home of the croissant burger, a croissant stuffed with crispy, crunchy soft shell crab, pickled cucumber, chipotle mayo, smoked eel, a fried egg and chorizo dust, you have to try one of the most decadent brunch dishes in Melbourne at least once at White Mojo! Four words: chorizo and cheese fundidio. Served with hickory corn chips, dip them in melty, meaty fondue for the ultimate Friday night out at Pablo Honey. 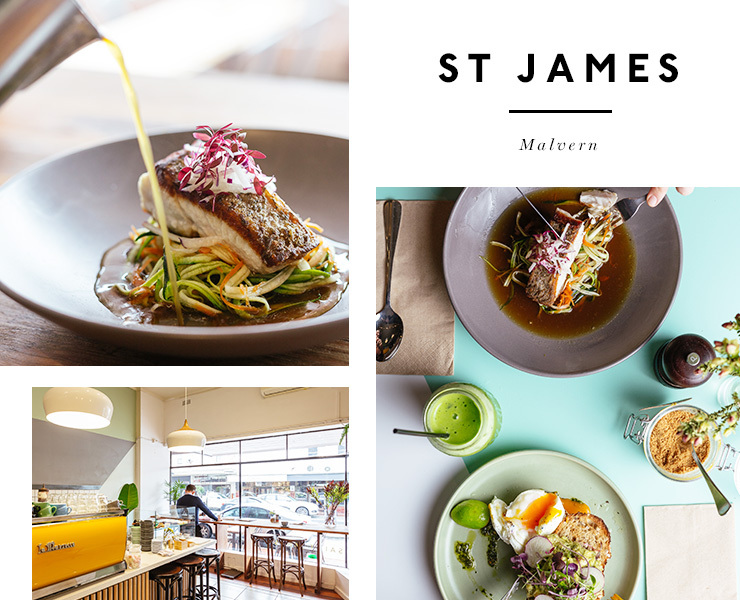 Nestled amongst the antique stores on Malvern Road, Saint James is serving up delicious food like coffee pikelets, or a classic 'fish finger sarnie'. It also has a beautiful sun filled courtyard which is perfect in Summer. Neil Perry’s budget-friendly eatery serves some of the best burgers for under $15. And you’ll get change. Drag your sea-soaked hair into Tenpin Kitchen this summer. There’s nothing better than a creamy, aromatic mild chicken coconut curry with kaffir lime, lemongrass, sweet potato and sugar snaps to finish the night. Long Story Short dishes out insanely Instagram-friendly meals like decadent Buttermilk Tim Tam pancakes with poached Nashis, vanilla peanuts, mascarpone, chocolate soup and crispies topped with Tim Tam gelato. At Minamishima, dining isn’t just about eating – it’s an experience. Hailed as Melbourne’s finest Japanese restaurant, this is one visit to add to your diary. Smacking flavours in your face, Smäk Food House doesn’t make any sacrifices for their healthy food. Just go to Amaru. Really. Just go. Boasting innovative, modern Asian cuisine like leeks with a curry vinaigrette and yoghurt, anchovies might not be your favourite food, but Anchovy is definitely in our good books. Fly Thai high at Chalawan. Serving modern Thai cuisine, make sure to order the Hanger Steak Tartare Seasons with Chalawan’s spice on a bed of coriander. They might be coming from left of field, basing themselves in Carnegie, but Left Field is easily holding it’s ground with lines curling out the door on most weekends. Try the saffron poached pear with cinnamon coconut and date bircher. Temporarily closed for an interior and menu revamp – we’re betting the new and improved Nine and Three Quarters will be just as magical as the last. We’ve got our fingers and toes crossed, hoping they still offer their soy sauce marinated beef bibimbap. A luxury dining and drinking venue a stone’s throw away from Flinders St station, pair their crayfish “mac&cheese” with your favourite cocktail for post-work treat. Stomach space isn’t spared at this Fitzroy kitchen. From fried buttermilk chicken with sriracha mayo, to grilled haloumi burgers served with spiced pumpkin and pickle – this will be a feast to remember. This gorgeously styled St Kilda restaurant serves some of the best contemporary Japanese, hands down. Order Wabi Sabi Garden’s panko fish curry for a delightfully rich bowl of thickly spiced Jap style curry. Legacy’s menu is legendary. Hokey pokey hotcakes with honeycomb, orange, ricotta, vanilla bean crème fraiche, pomegranates and strawberries or passionfruit panna cotta with crushed pistachios, strawberries, grilled peach, kiwi and an orange poppy seed tuile? It’s like Sophie’s choice. The best hosts in Melbourne, guaranteed. High Society’s golden folded eggs with goats cheese, chilli, smashed peas, avocado and prosciutto on pumpkin loaf is fit for a queen. Looking for more deliciously 2016 things? Check out Melbourne's Best Doughnuts | 2016 Edition! Image Credit: Griffin Simm @ Penta.